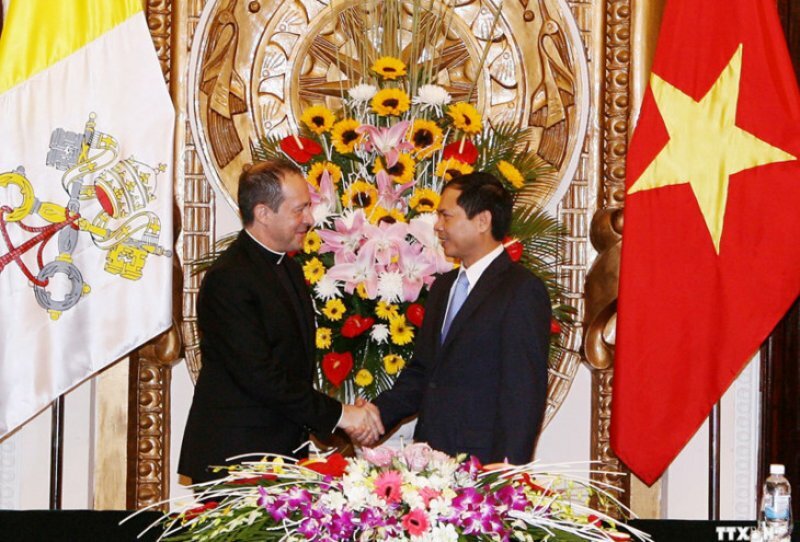 Hanoi (AsiaNews) - The visit to Vietnam by the undersecretary of the Section for Relations with States of the Vatican Secretariat of State, Msgr. Antoine Camilleri, (January 16-20), testifies to the progress of diplomatic relations between the Holy See and Hanoi. The Vatican delegation included Msgr. Francis Cao Minh Dung, head of the South East Asian Affairs Office and Msgr. Yovko Genov Pishtiyski, secretary of the Apostolic Nunciature in Singapore. During the visit, Msgr. Antoine Camilleri met with various representatives of the state. On January 18, Msgr. Camilleri met Vietnamese Prime Minister Nguyễn Xuân Phúc and his deputy Phạm Bình Minh, as Minister for Foreign Affairs, before holding talks with Bùi Thanh Sơn, Deputy Minister for Foreign Affairs and Vũ Chiến Thắng, head of the Governmental Committee for Religious Affairs. The Vietnamese premier stressed the results achieved by the country in 2017. He said that Catholics also contributed positively to these results, stating that the government always supports the unity of the people, Catholics and non-Catholic. The Prime Minister reiterated that the government persist in implementing the policy of respect for freedom of belief and religion, expressing particular concern for the development of areas in which Catholics face serious economic difficulties. Msgr. Camilleri greeted the Vietnamese premier on behalf of the Pope Francis, confirming the Pontiff’s satisfaction with dialogue between Vietnamese faith and the culture. "The Holy See is committed to promoting relations with the Government of Vietnam to further contribute to the social life of the country, particularly in the fields of education, health and charity. I confirm that the Holy Father has a special interest for Vietnam. Pope Francis also wants the Church of Vietnam to always accompany and contribute to the prosperity of the nation. The Vatican expresses its gratitude to the government for having created valid conditions for the non-resident papal representative to work in Vietnam ". The Deputy Minister for Foreign Affairs, Bùi Thanh Sơn, underlined the positive development of relations between Vietnam and the Holy See, declaring that the visit by the Vatican delegation is an opportunity to improve understanding, build trust and refine cooperation between the two sides. This is essential for solving problems in relations. During the pastoral journey, Msgr. Camilleri brought the warmth and closeness of Pope Francis to the Vietnamese Church. On 16 January, the delegation celebrated a Mass at the Cathedral of Saint Joseph of Hanoi, in the presence of Card. Peter Nguyễn Văn Nhơn, archbishop of the city, the Vietnamese clergy and thousands of faithful. Before the service, the Cardinal declared: "Bishops, priests, men and women religious and all the faithful of the archdiocese of Hanoi are very pleased to welcome the Holy See delegation. Through the honor of the monsignors’ presence, we would like to send our respects and our love to the Holy Father. We pray that God bless him. Our prayers will accompany you during your pastoral trip to Vietnam ". Msgr. Camilleri responded to this warm welcome, saying: "The Holy Father is aware of our visit and our mission in Vietnam. He sends blessings and prayers to all of you ". The following day, the Vatican delegation went to the Episcopal offices of the diocese of Phát Diệm, where he visited the complex of the Cathedral of the Queen of the Rosary, built in 1875 and associated with the cultural identity of the country. On January 19, Msgr. Camilleri celebrated mass at the shrine of Our Lady of La Vang, where thousands of faithful gathered. After the service, he went to the church of Phủ Cam, in the city of Huế, the capital of the province of Thừa Thiên-Huế. Here the prelate visited the nuns of the monastery of Cát Minh Huế, the community of the Congregation of St. Paul in Kim Long, the Daughters of Our Lady of the Immaculate Conception and the Major Seminary. On the last day of the visit, the delegation stopped at the offices of the Vietnamese Bishops' Council in Ho Chi Minh City, where the Holy See Representation resides in the country. Later, Msgr. Camilleri celebrated a thanksgiving mass with 11 bishops of the archdiocese in the Cathedral of Our Lady. The function saw the participation of thousands of priests, religious and faithful. During the pastoral visit, Msgr. Camilleri reiterated to Card. Nguyễn Văn Nhơn, the bishops, priests, religious, seminarians and Vietnamese lay people that "the Holy Father Francis is very close to the Church of Vietnam and its faithful. He accompanies the Vietnamese Church with affection. The Pope shares in your joy, success and concerns. I would like to confirm it even more. And in his fatherhood, he wants the best for society and the Church in Vietnam ".